S.A.F.E. Management is very excited to have had four of our wonderful supervisors recognized at the Year One “Heroes of Hospitality” event at Mercedes-Benz Stadium. 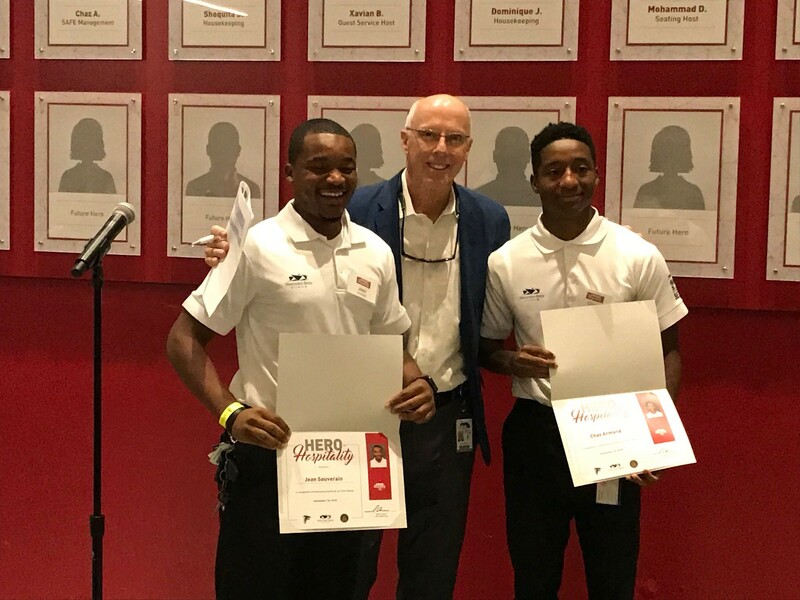 The management team at Mercedes-Benz Stadium took the time before the September 30th Atlanta Falcons game to recognize 26 staff members that work on game days making the fans experience the best of the best. These award winners dedicated time and energy to make fans the number one priority on game day. They each received a pin, certificate, and a breakfast to celebrate their success. They also have their photo displayed outside of the Gullwing Club, in Mercedes-Benz Stadium. Atlanta Falcons President and CEO Rich McKay and AMB Group CEO Steve Cannon took a photo with our team members, read the story about the heroic job they did, and delivered a powerful message about how the stadium is beautiful but the memories made here are the ones that will last forever. We are proud to have these Heroes on our team and part of the S.A.F.E. Management family.